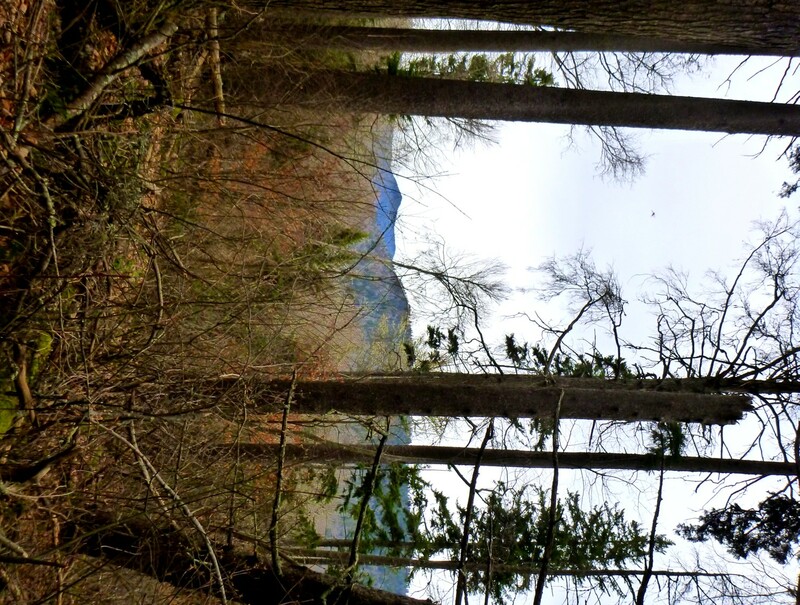 Posted by Jenny in bushwhacking, hiking, Meteorology, Smoky Mountains. I woke up this morning to cool, clear, radiant skies. By 12:30 today, I was walking through sleet. I didn’t know the weather would get so fantastically complicated. The forecast called for clouds to develop later in the day and for possible showers overnight into tomorrow. To me, it looked like a great day for a hike. 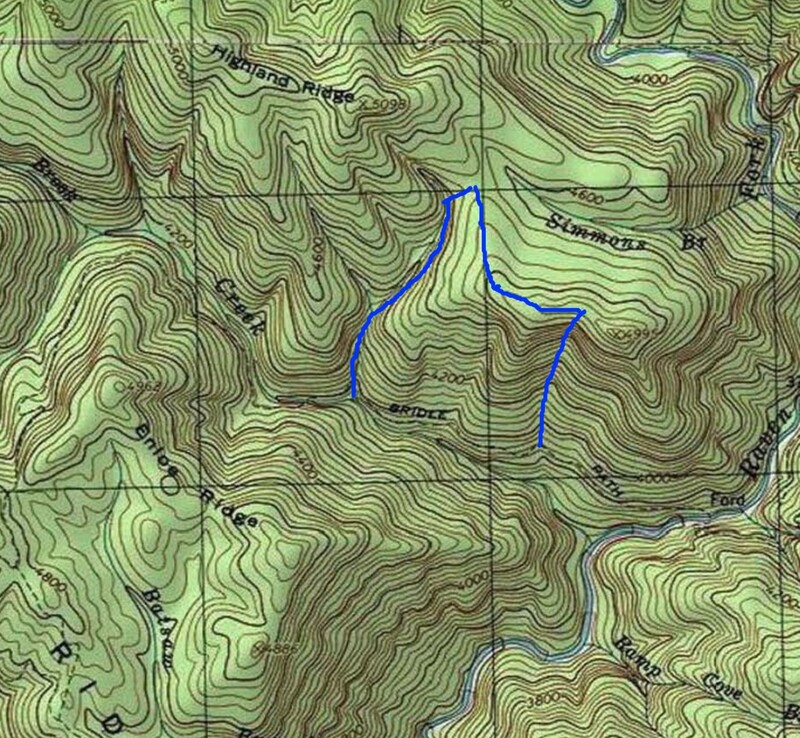 I decided to take the Breakneck Ridge manway from Hyatt Ridge down to Three Forks, the place where the Left, Middle, and Right Forks of Raven Fork join and form the famous Big Pool. 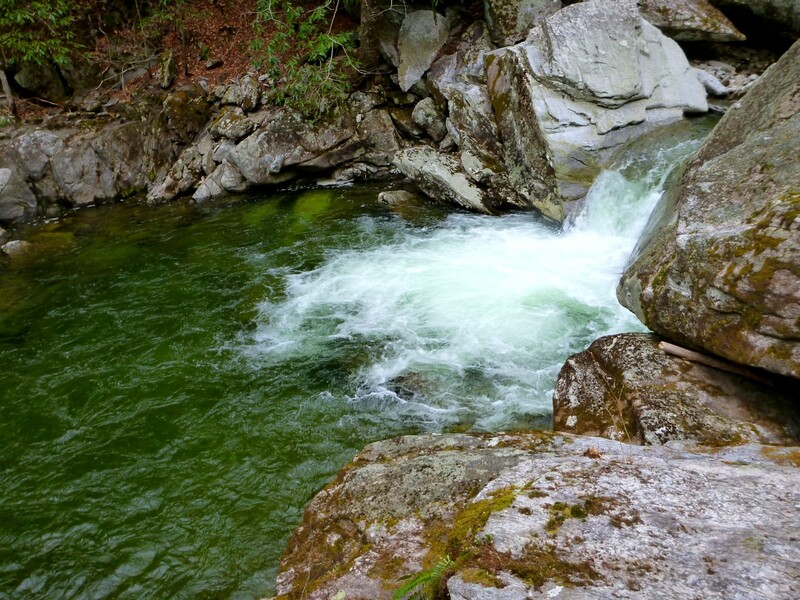 When I got down to the pool, I’d decide whether to retrace my steps or follow Right Fork around to a tributary that leads up to McGee Springs. As it turned out, I made it about a third of the way on the manway before I decided to turn around because of the weather. 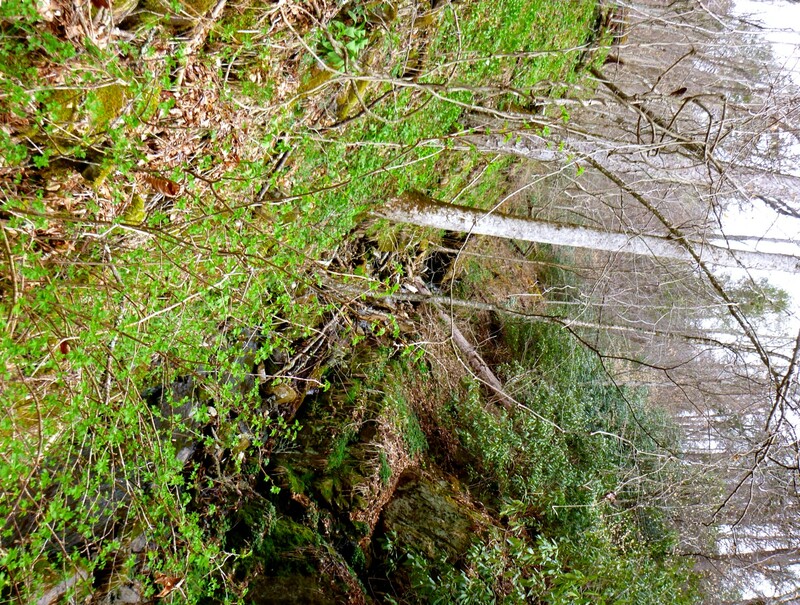 The temperature was 43 degrees at the Beech Gap trailhead on Straight Fork Road. Chilly! But the sun shone brightly and everything looked fresh and green. A little knowledge is a dangerous thing. It was neither (a) convection nor (b) a front coming in but (c) an upper-level disturbance associated with a short-wave trough (according to the “Scientific Forecaster Discussion” on my weather website). 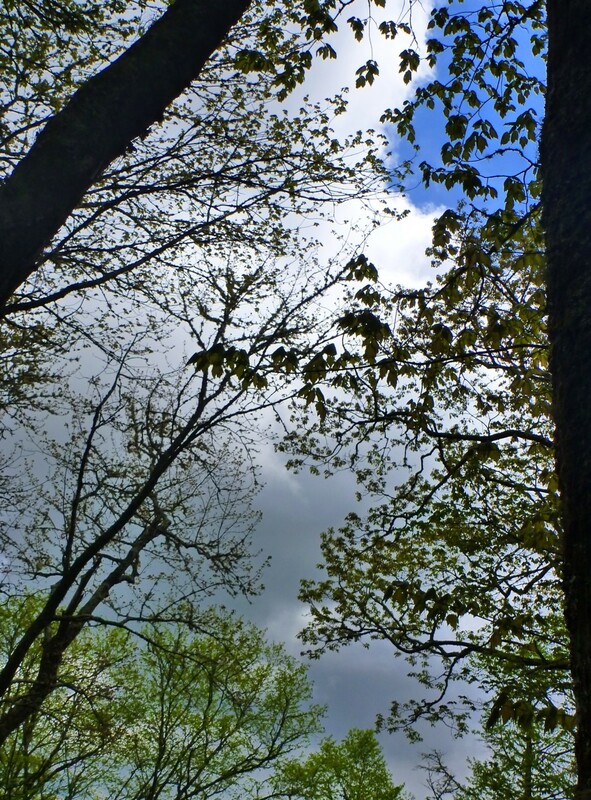 I still had periods of sunshine on the upper Beech Gap trail. Cold, gusty winds hit me when I reached Hyatt Ridge. I’d guess it was in the upper 30s. I turned north on the trail and before long came to the eastern terminus of the manway. 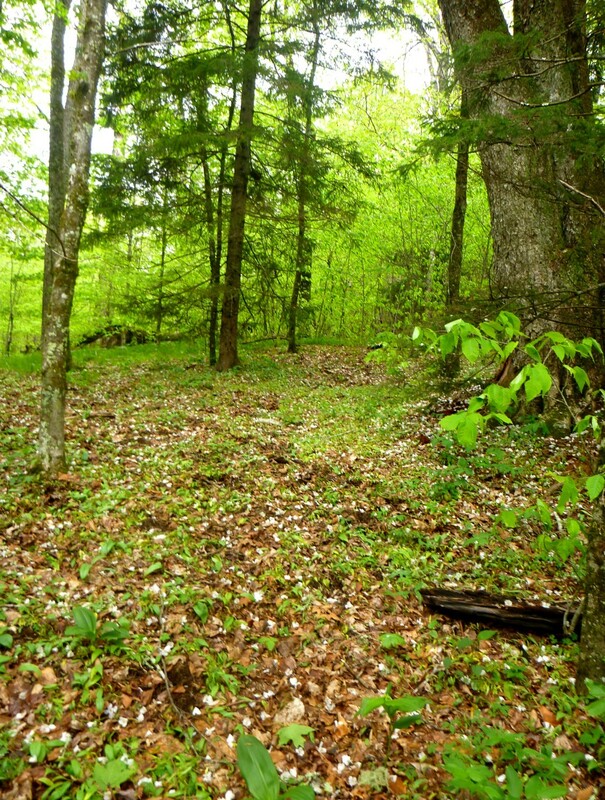 There are three ways you can find it: pay attention to the shape of the ridge, look for a landmark sugar maple, or find the piece of pink surveyor’s tape. 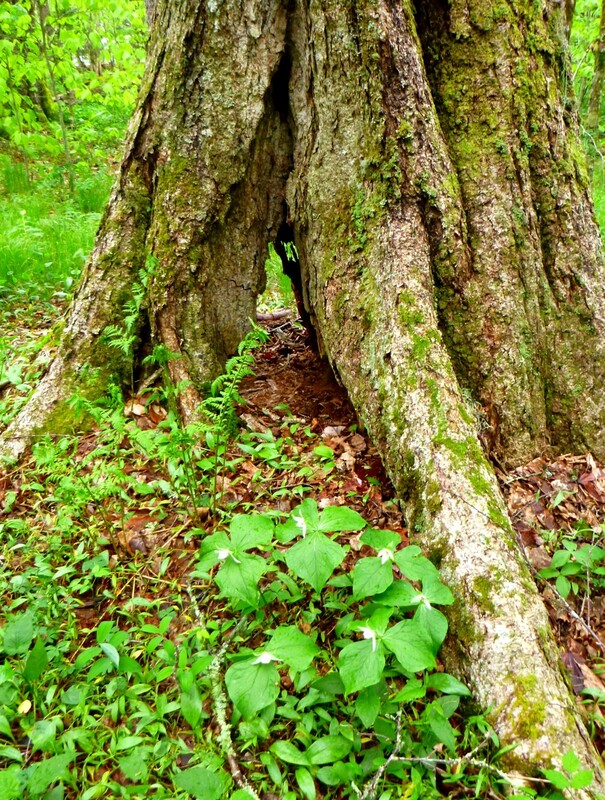 This maple with a see-through trunk is at the junction of the manway and the Hyatt Ridge trail. I didn’t need the tape to find the start of the manway, but it became helpful as I went along, especially since I’d never been on Breakneck Ridge before. I’m not crazy about surveyor’s tape, and I’ve been known to take it down in certain places, but this manway seems like the kind of place where tape is useful and appropriate. It helped that the pieces of tape were short and unobtrusive, unlike the long streamers you see sometimes. I found three vintages of tape: a faded pink, a newer pink, and a blue. In places the manway was close to invisible. Manway runs straight ahead. See it? In other places it was obvious. Unfortunately, there is a lot of hog damage at the eastern end of the manway. I spotted a pair of the critters. They gave me a loud snort and trotted away. 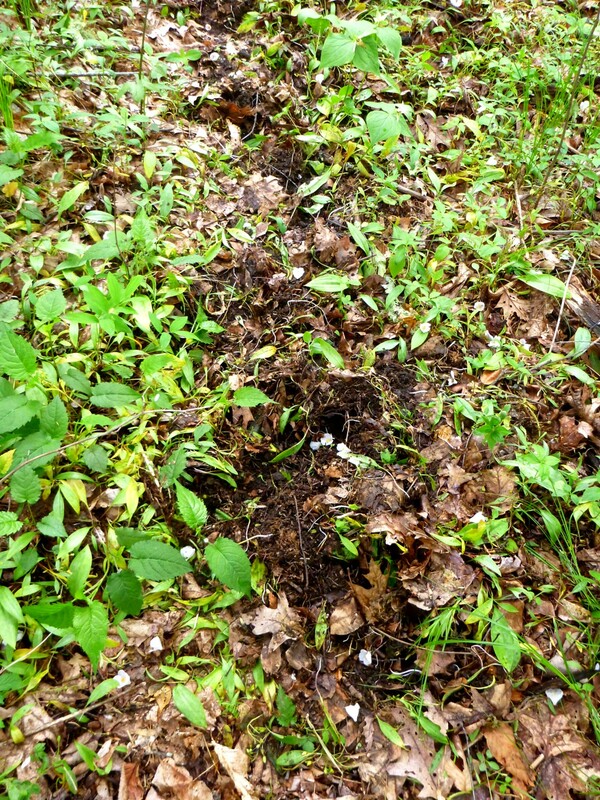 Hogs have been rooting up the ground through this area. The sky was getting quite dark. Dim sky on the ridge. A shower came through. It lasted about five minutes. But at that point I decided to turn around. The weather had changed so quickly that I figured anything could happen—including a hypothermia-inducing downpour. Reluctantly I retraced my steps. Even with the fluctuating skies, I enjoyed being up in the enchanted forest above 5000′ in a very wild part of the Smokies, full of moss and gnarly old spruce and all kinds of thriving green plants. 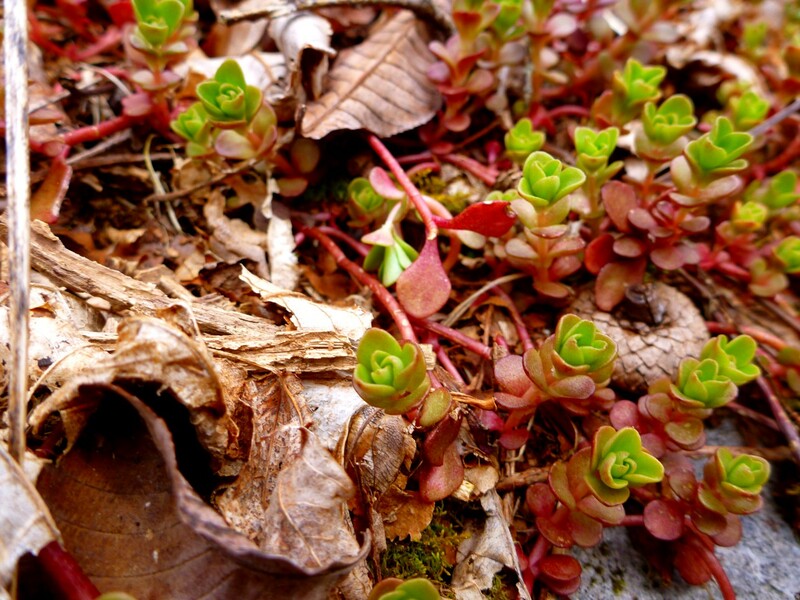 Mini-garden at base of mossy old tree. 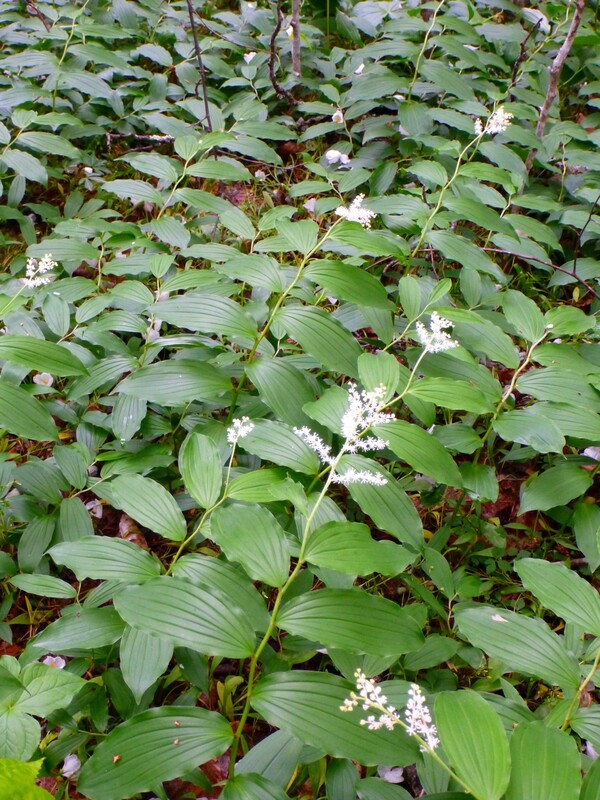 Big swath of false Solomon’s seal. This yellow birch seemed more like a golden birch. Light showers came and went, as if individual clouds were spattering moisture and moving on. 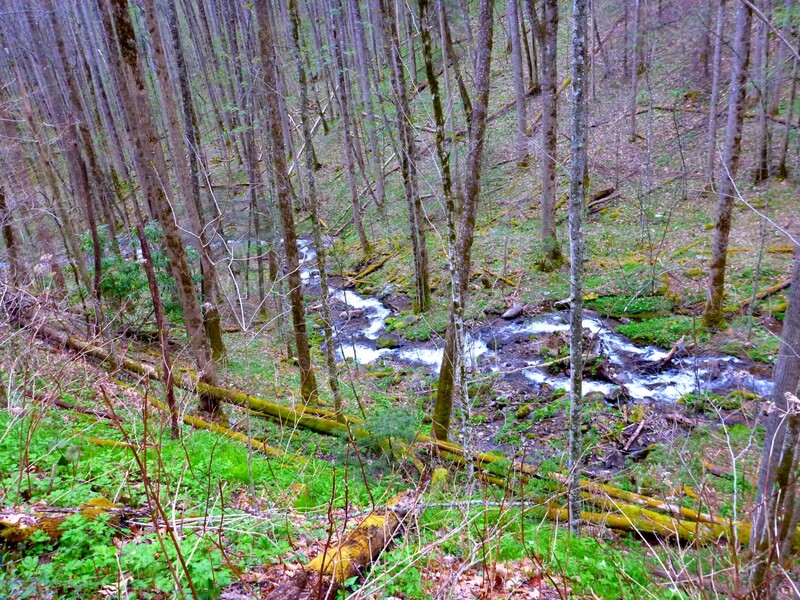 I got back to the Hyatt Ridge trail, walked down to the Beech Gap trail, and heard a strange seething noise unlike rain. 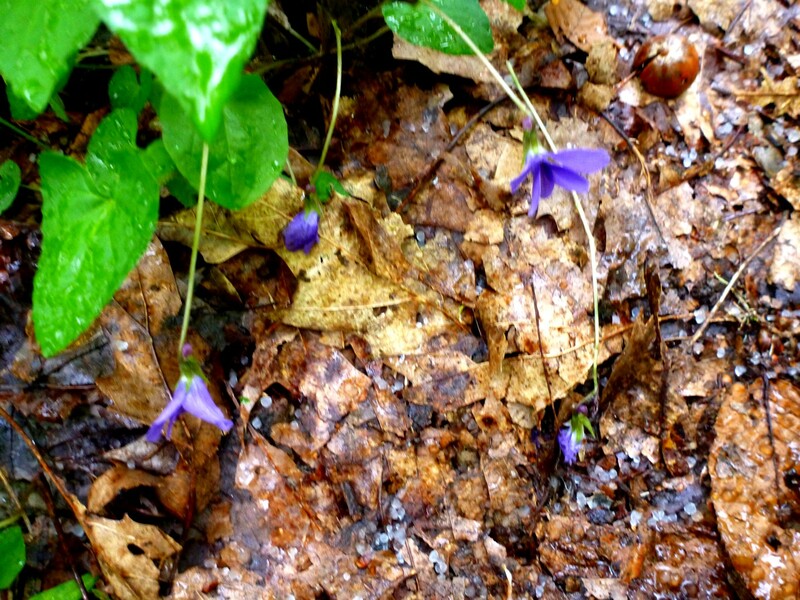 It was sleet pattering down on the leafed-out trees. At lower elevations, it turned back to intermittent rain. When I got back home, I learned that LeConte received a dusting of snow. It was a beautiful day, even though it didn’t turn out the way I expected. I’ll be back to continue my exploration of Breakneck Ridge. 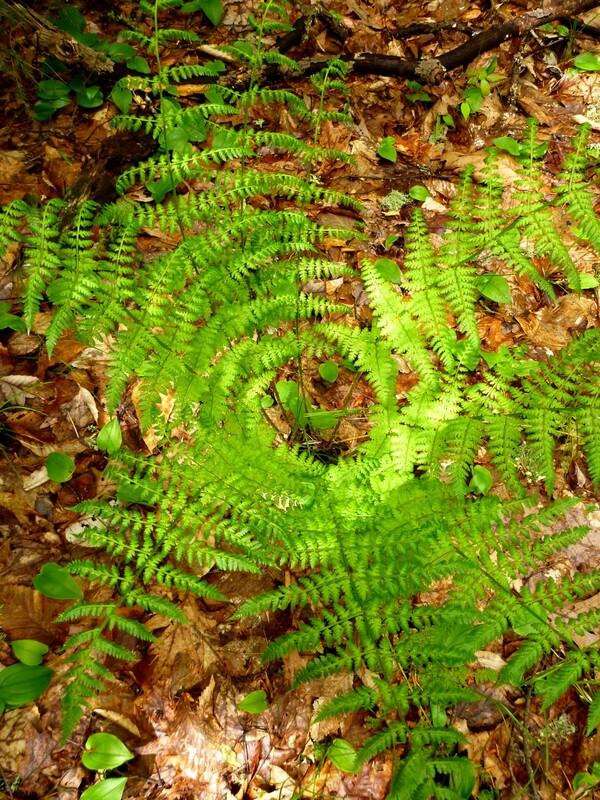 The circular world of a fern. 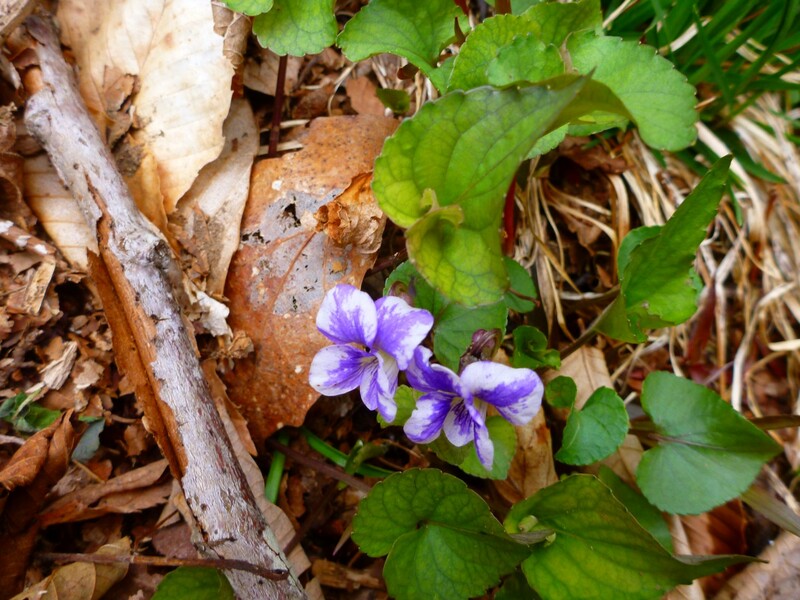 Posted by Jenny in bushwhacking, hiking, nature, plants, Smoky Mountains. I say this is close. 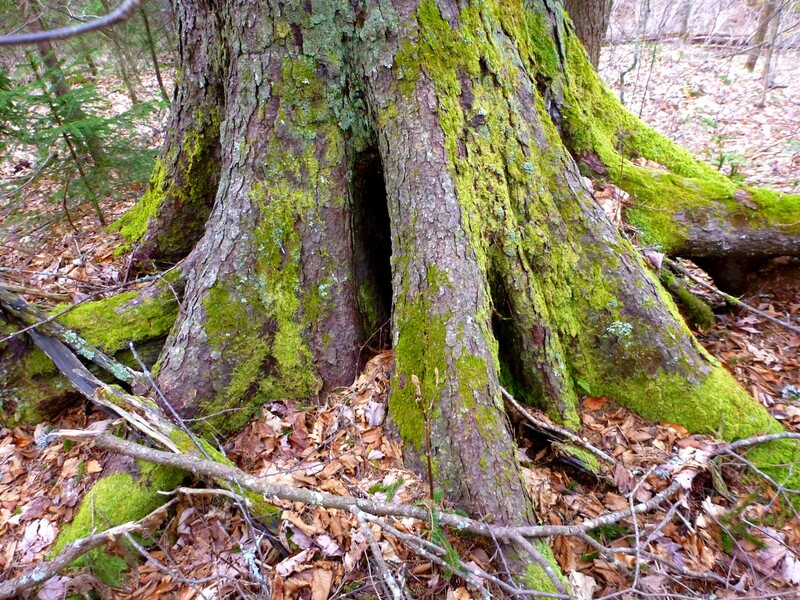 Ever since I read a trip report by members of the Eastern Native Tree Society about finding a record-size red spruce in the Raven Fork area, I’ve wanted to go there myself. In a way my mission was silly. I don’t have the scientists’ instruments for measuring the height of trees. 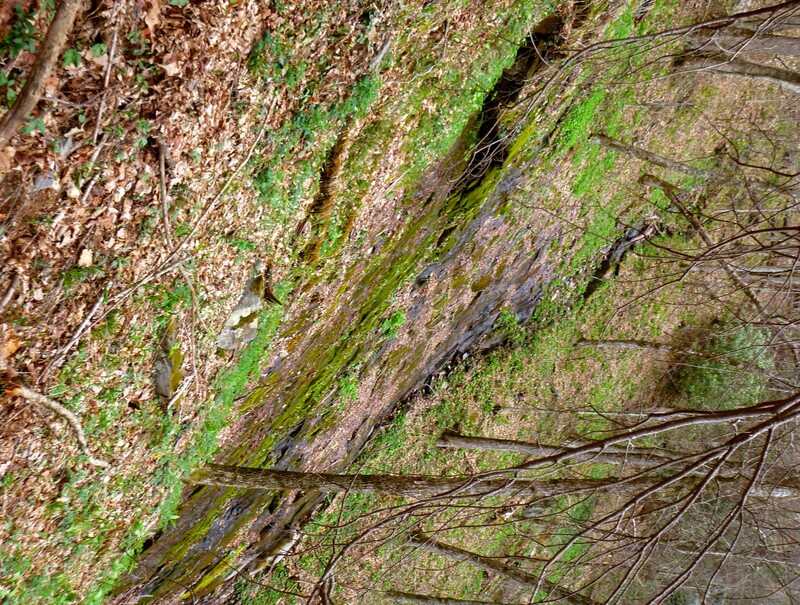 Maybe what it boiled down to is that I just wanted to wander around in that incredibly wild area in the quadrant northwest of the Raven Fork/Enloe Creek junction. 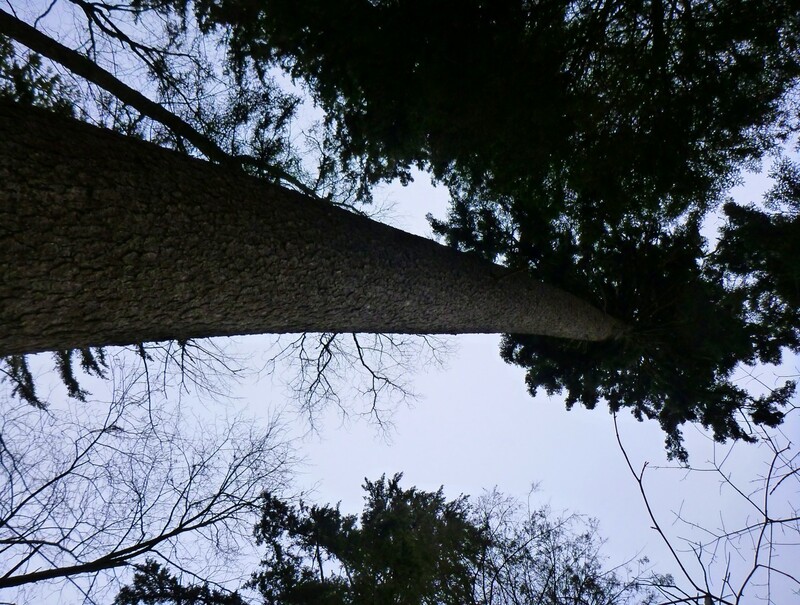 The ENTS team found a spruce in the Simmons Branch valley that they measured as 146.7″ tall and 12’8″ cbh (circumference at breast height). Those dimensions combined make it a national champion, they said. They found another leviathan even taller, 155’3″ tall, but not as thick (10’7″ cbh). 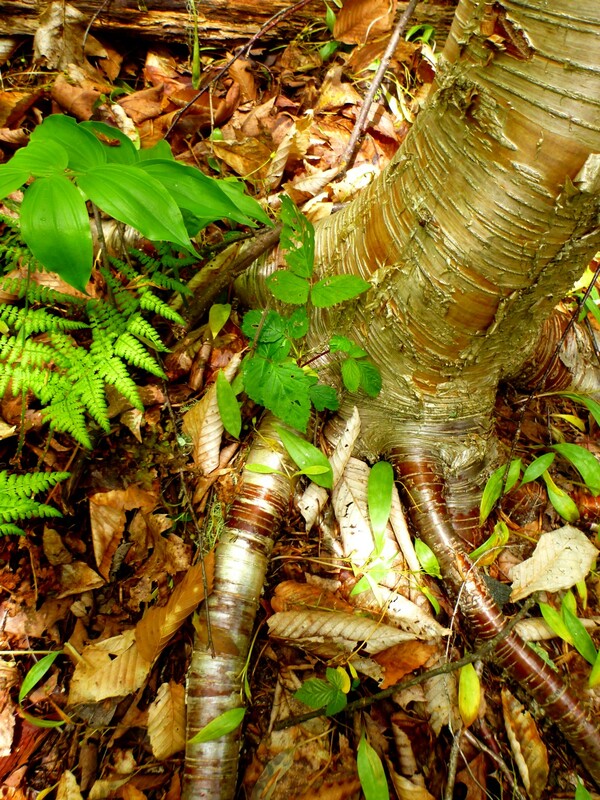 They also found all kinds of other wild, weird, gigantic trees, such as an enormous yellow birch with adventitious roots like those of a strangler fig. But what is it about spruces? When my friend Brian Worley and I went exploring up there yesterday, we saw skeletal hemlocks that were bigger. But spruces are not usually as large as hemlocks, and I’ve developed a special fondness for these dark, dense evergreens that crown the heights with their sharp pointed tops. 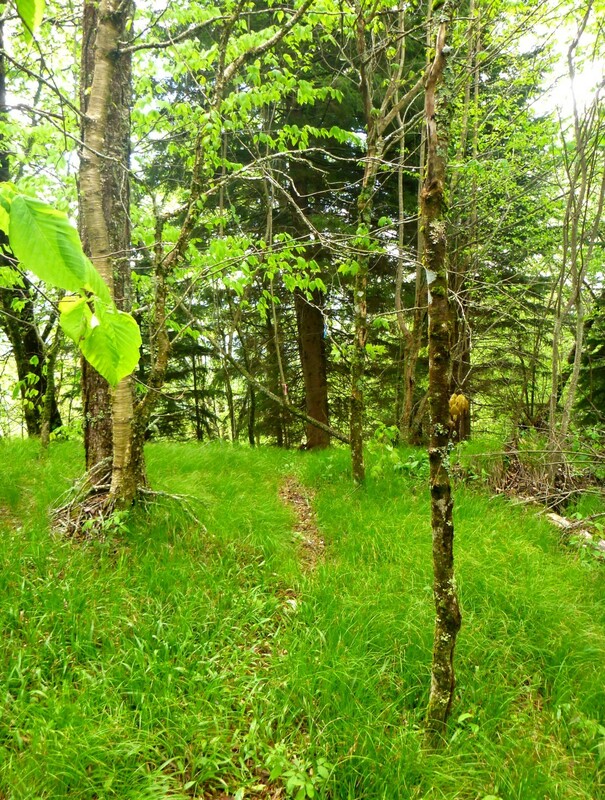 I always look for the first spruce when I climb a mountain, though it’s usually a baby. And I always look for those dark shapes on the remote beckoning tops of the farthest heights. Our route west of Raven Fork and north of Enloe. 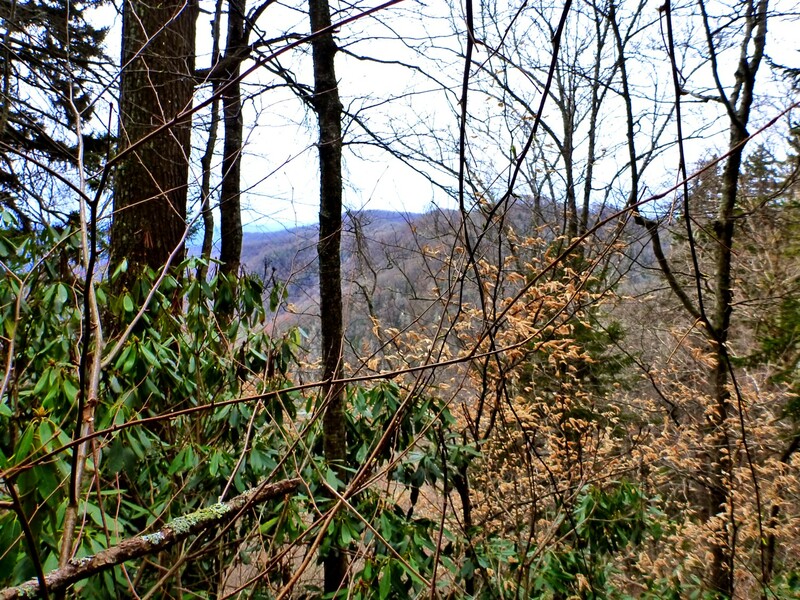 On an overcast day with refreshing cold winds, we climbed up the Hyatt Ridge trail and descended to Raven Fork. It was my pleasure to introduce Brian to these places. 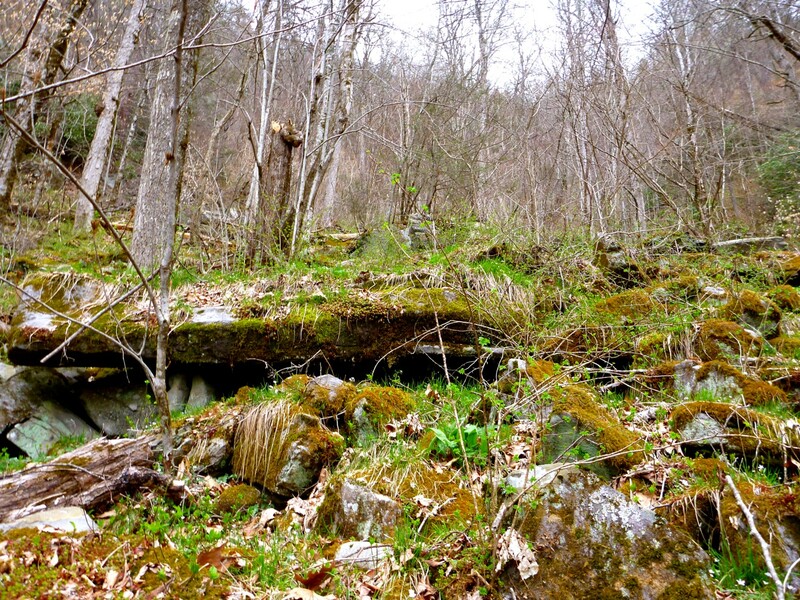 He is a long-time bushwhacker who lives in East Tennesse and had never visited this area. We stopped for a rest and a snack at the hemlock boulder on Raven Fork—the one where the Park Service has treated the landmark trees for the woolly adelgid. We admired the stream. Here came the tricky part—the ENTS report said the team left the Enloe Creek trail “about a third of a mile” past the metal bridge. I actually spent time with my maps and an architect’s ruler, measuring the trail against the map scale. I came up with a plausible departure point. But even if I’d identified the correct spot on the map, we then had to match it to the actual location. I still can’t be certain we selected exactly the same route visited by ENTS, but we left the trail at a nice little stream valley and started to climb. Lower valley where we left the trail. We climbed from about 3800′ to 4800′ up this valley, finding it remarkably free of thick brush. It seemed too good to be true—and in fact the rhodo-free conditions didn’t last. 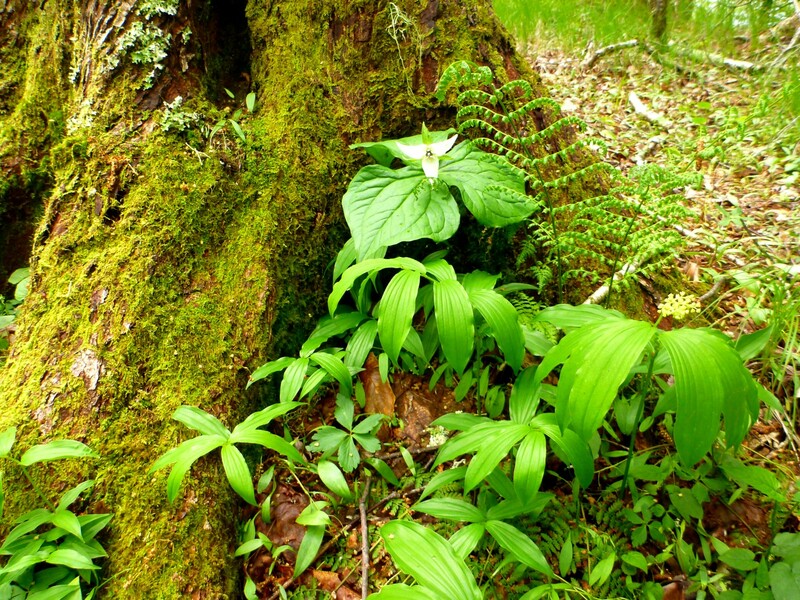 As we climbed, we found the forest floor carpeted with the infinitely variable shapes of new green leaves. We climbed through a boulderfield. There were lots of ramps. 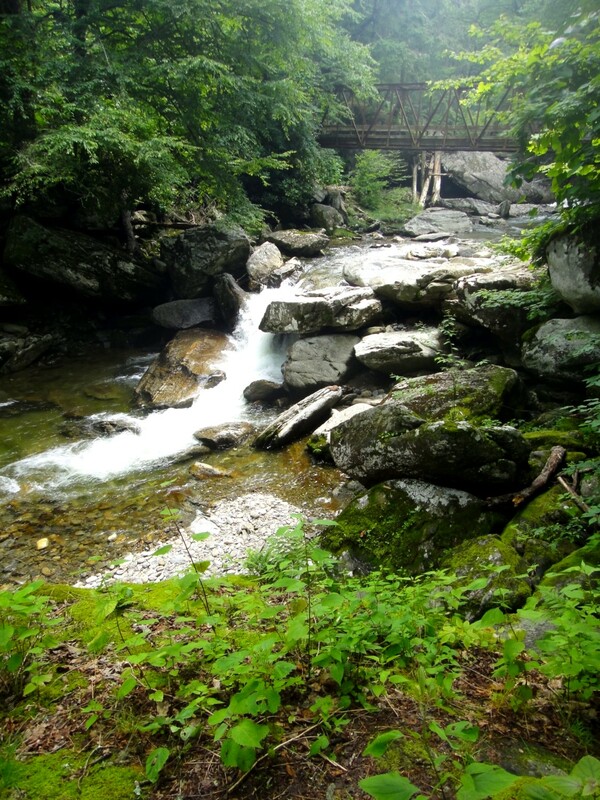 The way grew progressively steeper, and we passed a cascade. We had to start picking our way around obstacles. As we reached the top and got into thicker brush, I took a photo looking south, toward Hughes Ridge and Ace Enloe Ridge. 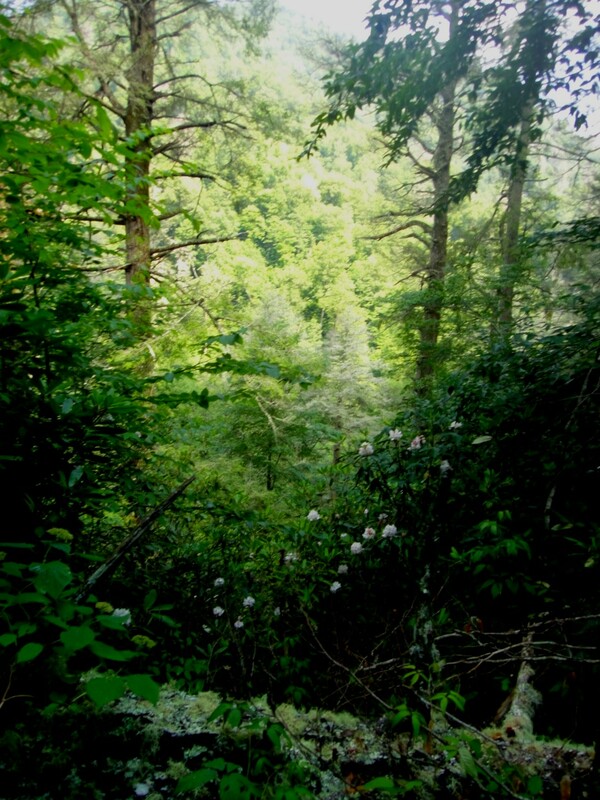 Suddenly we found ourselves in dense rhodo, standing on the ridge that marks the southern boundary of the Simmons Branch drainage. The ENTS route took them down toward the stream to the northwest. But their description said they’d emerged on the ridge in a heath bald, and we saw no heath in any direction. And as we gazed into the incredibly dense, snarled, wild forest between us and Simmons Branch, we realized that we might have bitten off more than we could chew. We’d gotten a late start, and we were facing the possibility of getting caught out in the dark looking for the national champ. Since the second 150-foot spruce was located near a saddle between Simmons and the next stream drainage to the west, we decided to keep to the high ground and head over to the saddle. We worked our way through the enchanted forest, seeing many tall spruce and one of the largest sugar maples I’ve ever come across. 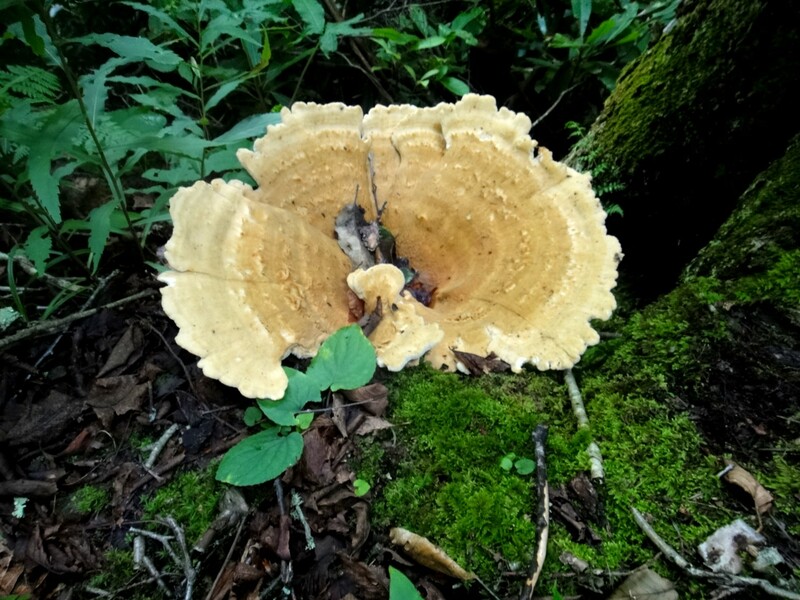 Even the fungus growths were larger than normal. 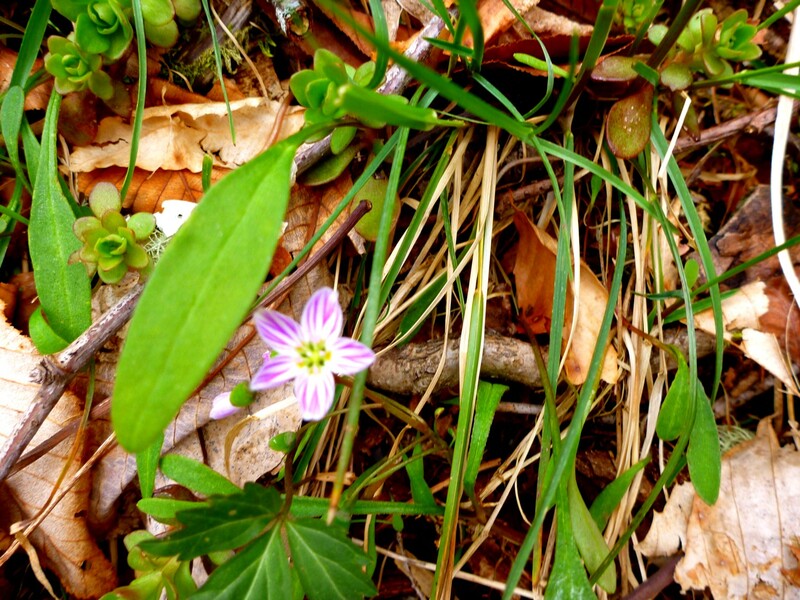 We crossed occasional stretches of open ground, but most of the time we fought through rhodo and blackberries. The going was very slow. We reached the saddle and turned west, soon finding the spruce pictured at top. Rhodo hemmed in its base. But as I gazed up the towering trunk, I felt that we were in the presence of a giant. Of course, we’ll never know its actual height or whether it is the second one mentioned in the ENTS report. 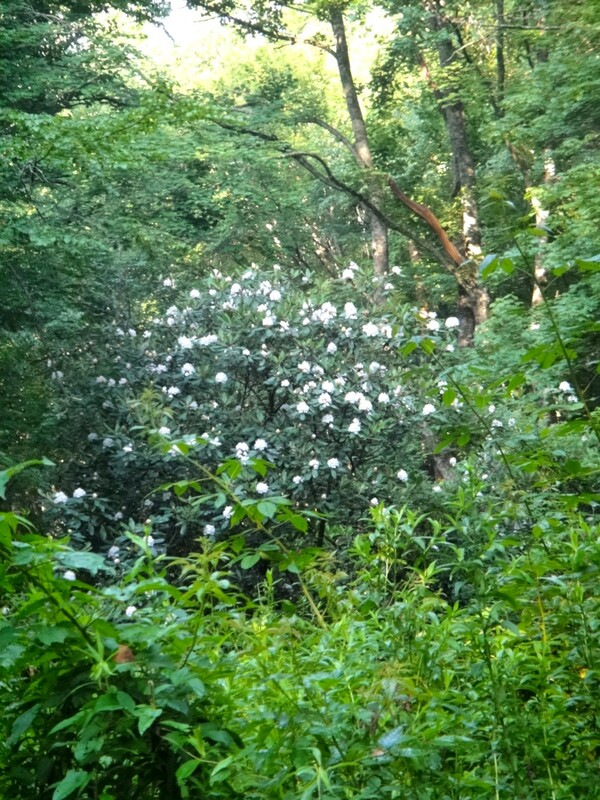 We made our way down into the unnamed tributary of Enloe by a small draw choked with rhodo and the thickest blackberry canes I’ve ever seen (thick in their diameter, I mean). Things finally opened up and we were able to make faster progress. This valley had the opposite gradient than the one we’d ascended by, being steepest toward the bottom. 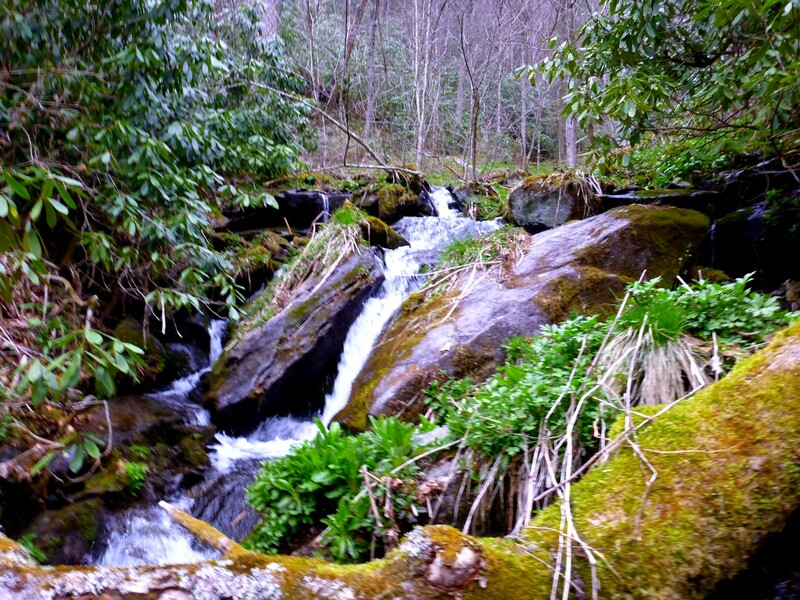 The stream cascaded down over attractive waterfalls, and we finally returned to the trail. Stream where it meets the trail. Enloe Creek was plunging along with high water levels. It was beautiful. 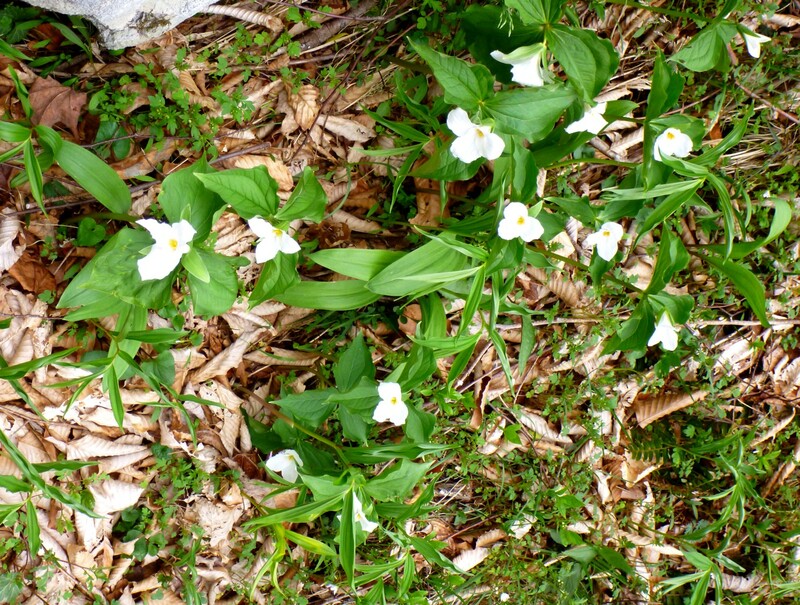 All through the day, we saw countless white trillium. 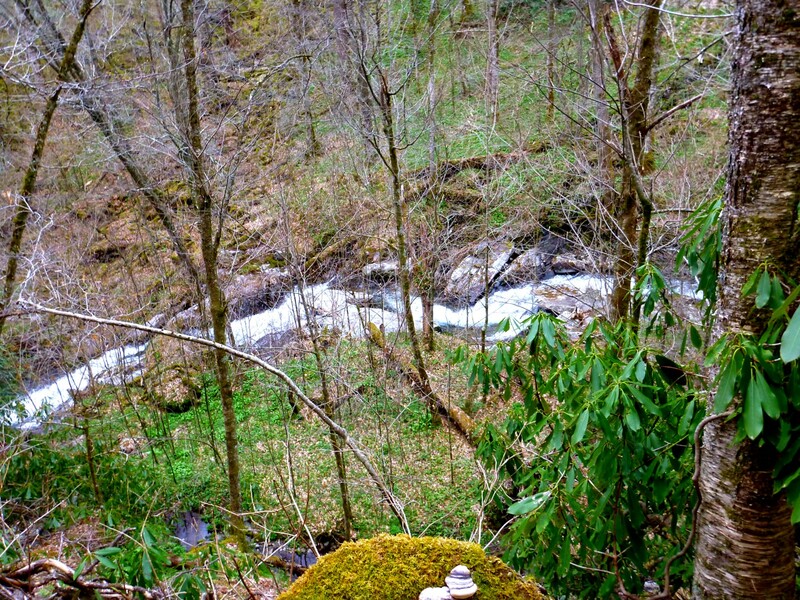 We stopped for a snack beside my favorite Raven Fork pool before making the climb back up to Hyatt Ridge. 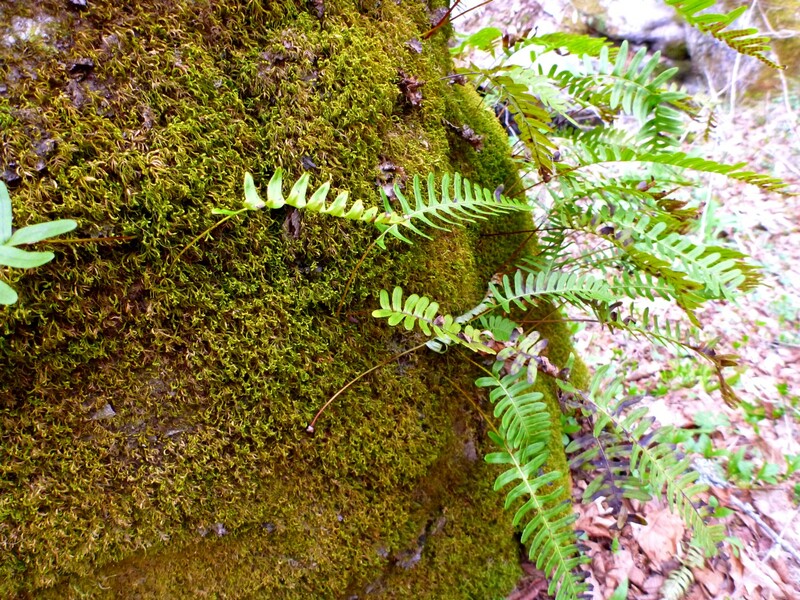 Polypody ferns attached to tree trunk. 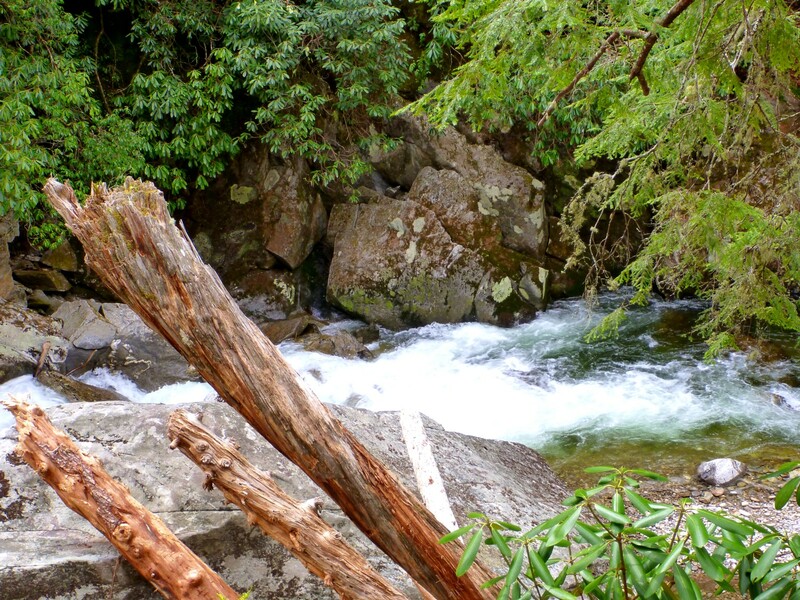 We descended along Hyatt Creek in a light, gentle rain. All the plants were once again being nourished by the rain clouds so that they will grow and thrive. Ah, the Smokies in April. Indescribable. 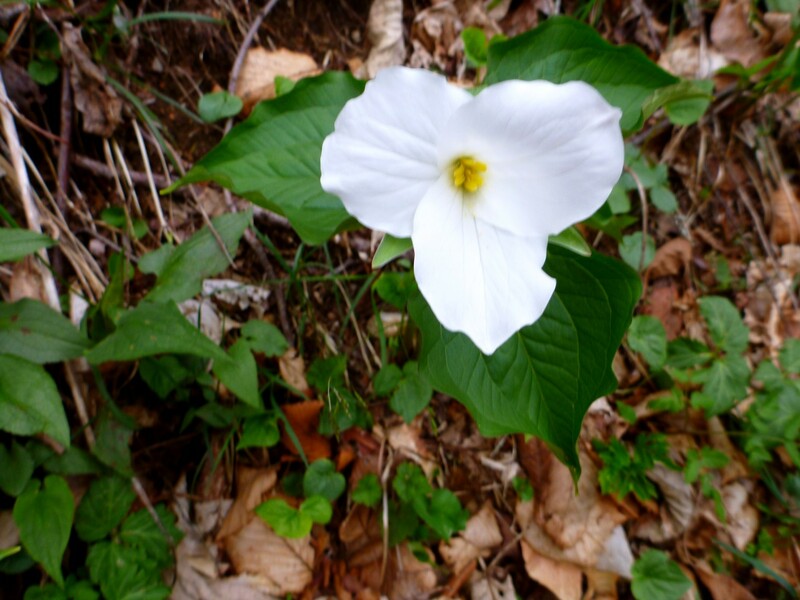 Posted by Jenny in hiking, Smoky Mountains, trail maintenance. 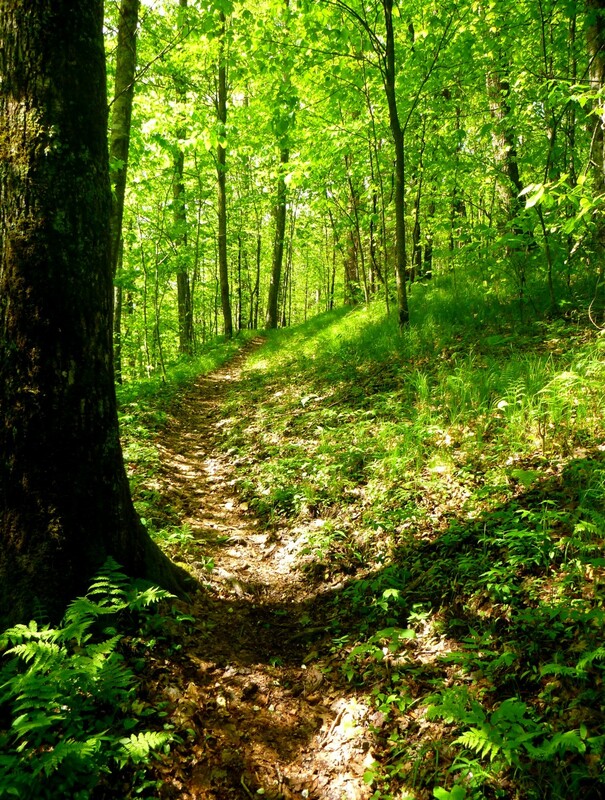 It was time to return to my adopted trail, the Enloe Creek trail, to attack the soft vegetation with a swingblade. On my last trip, I did my best to deal with encroaching woody shrubs with a pair of loppers. 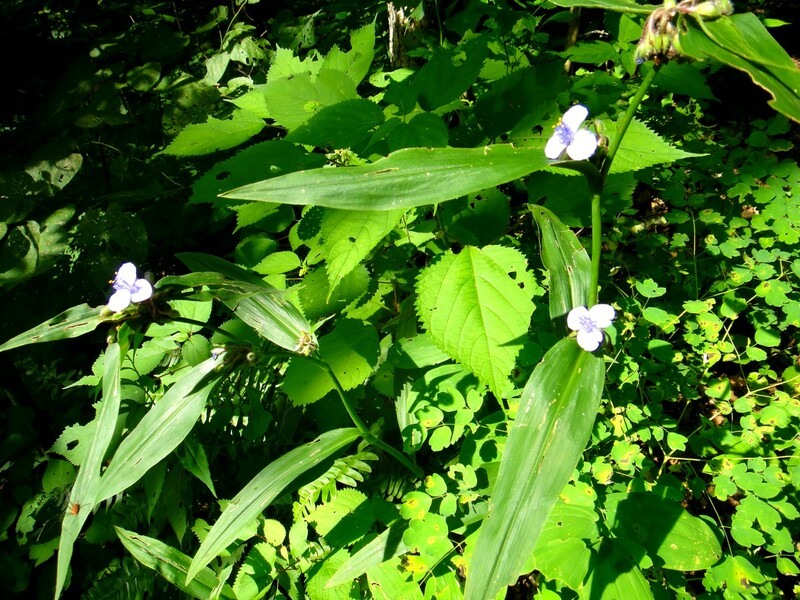 This time, nettles were the main enemy. 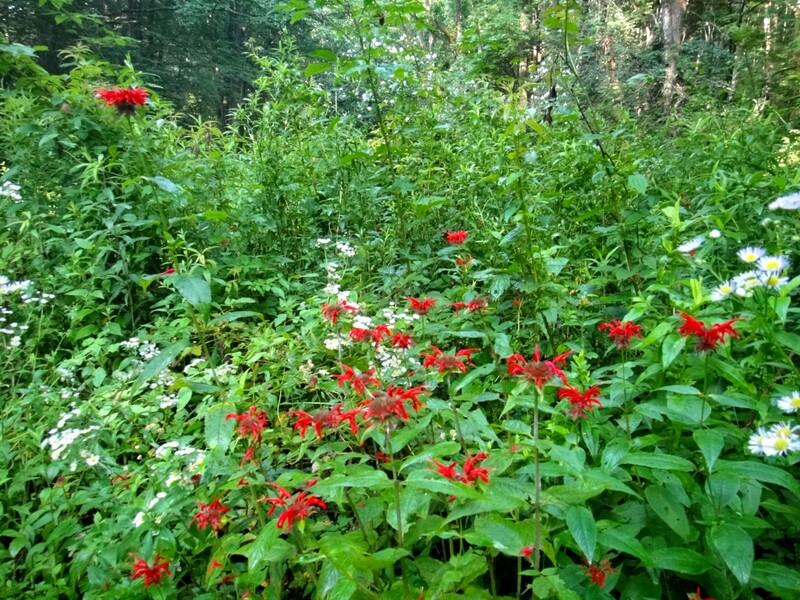 I spotted the patch of bee balm at the trailhead. 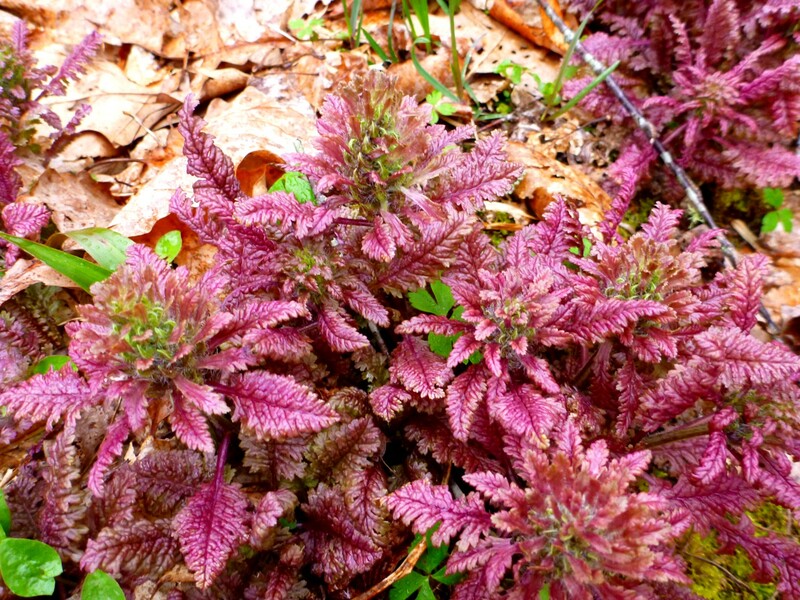 You will notice not only the pretty red flowers but the crazily luxuriant vegetation in general. 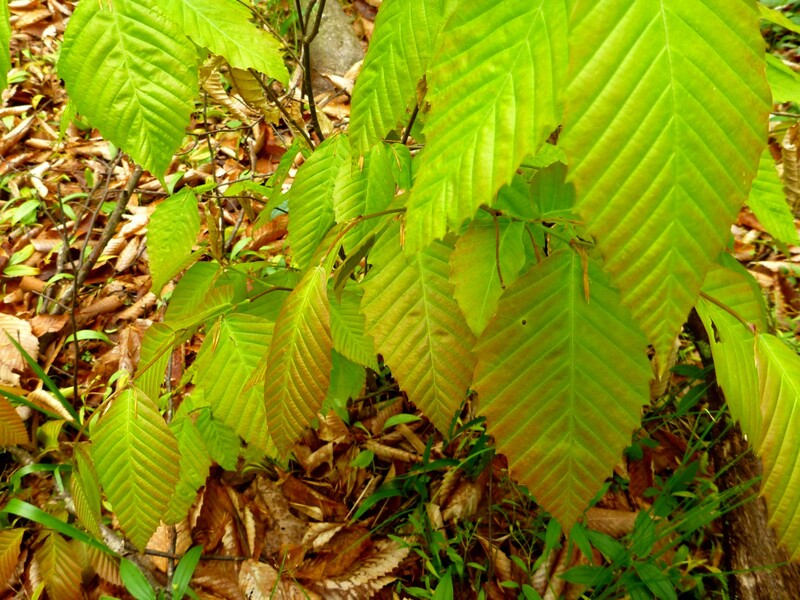 We are getting into the season when leafy plants try to take over the world. Behind the bee balm I noticed an especially beautiful rosebay rhododendron. It was so tall, so dominant, the king of the shrub world. I walked up to the start of my trail at Hyatt Gap and immediately discovered a very large and complicated blowdown. The falling tree had actually managed to lever a large waterbar out of its embedded position and stand it on end. I clambered over the mess and started my work with the swingblade. After my experience straining my wrist with the loppers on the last work trip, I tried to focus on the mechanics of the swing, letting gravity and momentum do the work instead of muscling the tool up and down. I must have been successful, because I didn’t strain anything this time. I hate to cut down ferns, but they were growing right in the middle of the trail mixed in with the nettles, so down they went. 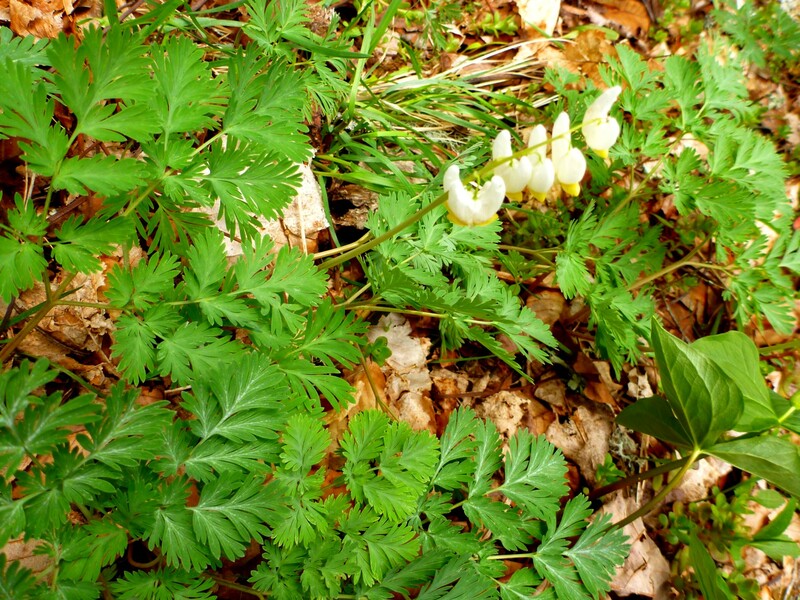 I cut down blackberries, black cohosh, meadow rue, and anything that encroached on the trail. 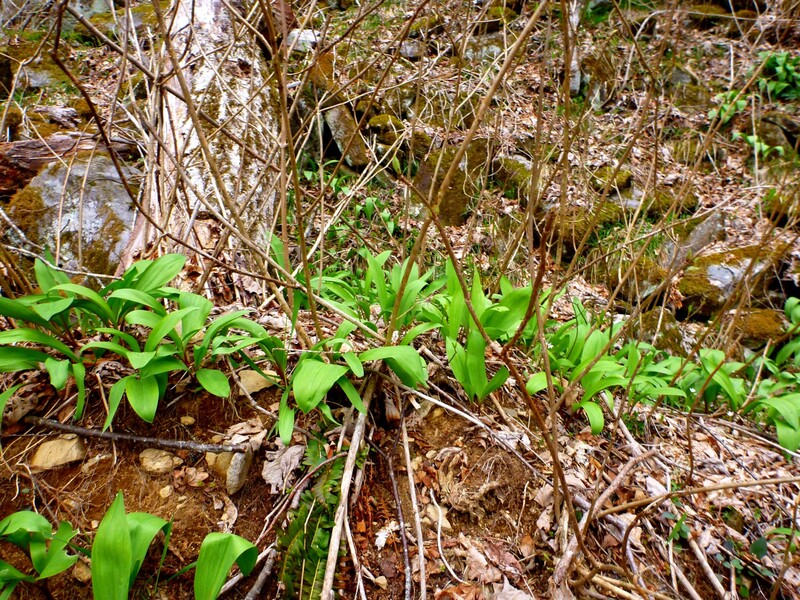 I would feel bad about the destruction of plant life except that this trail is nearly engulfed by a true wilderness, all kinds of plants embroidered together in an infinite tangle. As I approached Raven Fork, a slight opening in this wilderness allowed me to gaze at Katalska Ridge, an area I plan to explore off-trail in September. There are said to be record-size red spruce lurking high up in the valleys of Simmons Branch and Hideaway Brook, places practically no one ever goes. 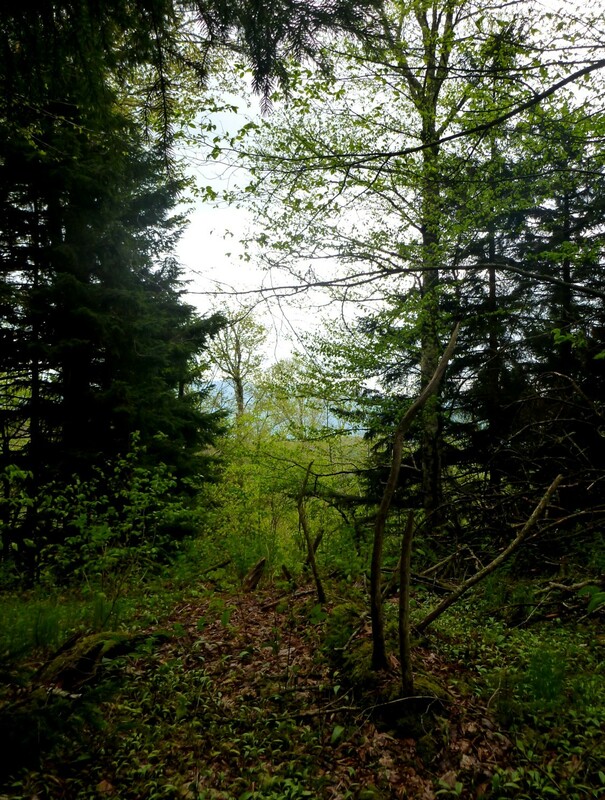 In the photo below, you can see Katalska in the distance, an absolute wall of vegetation. 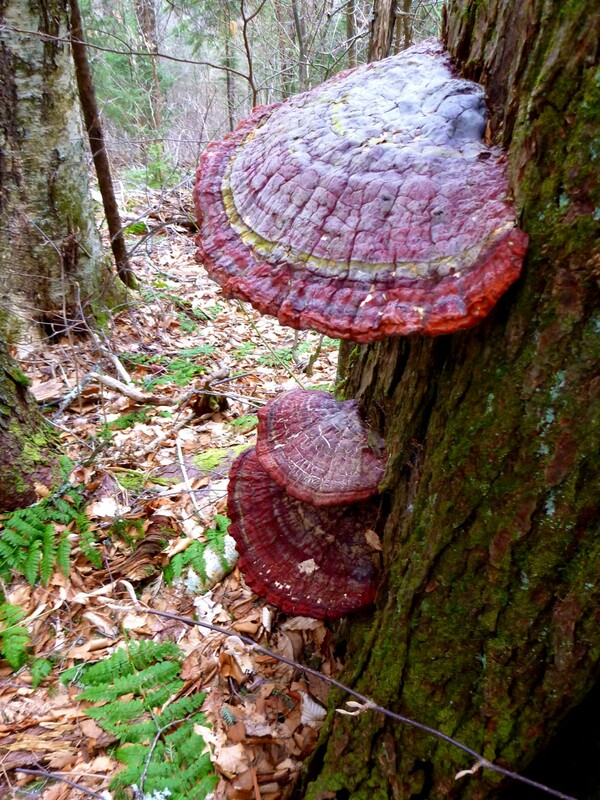 I noticed a giant fungus perched at the bottom of a dead hemlock. At last, swinging and whacking my way along, I reached Raven Fork. I never cease to be amazed by its beauty. Each time, I gaze at it from a different perch. At that point, I decided to turn around, for two reasons: (a) a thunderstorm was approaching with ominous rumbles; and (b) the blade part of my tool had loosened and was in danger of flying off, despite my attempt to use a car key as a screwdriver to tighten it. Next time I will bring a screwdriver. 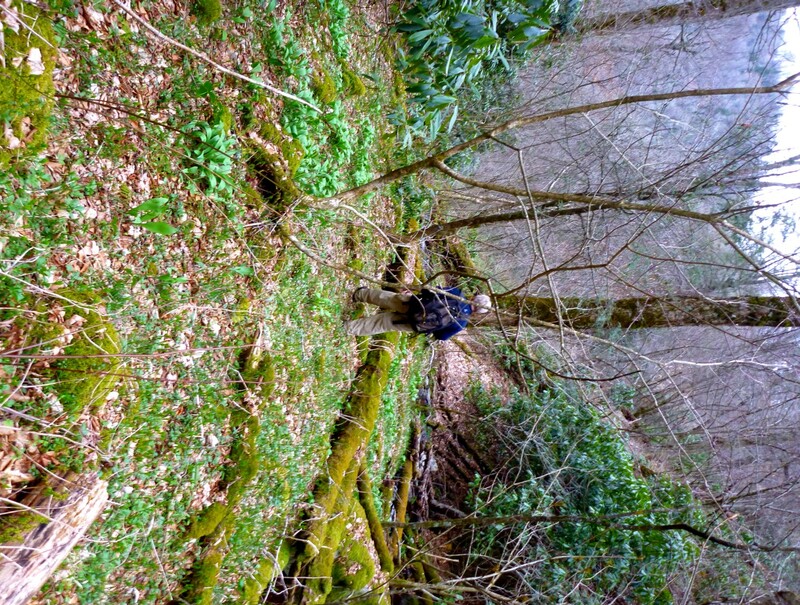 So, nettles west of Raven Fork, I’ll be back!